I drive to Fredericton from Guelph every bridging weekend between September and October to visit my aging parents, to see the tree leaves signal their riotous death-parade along the Saint John River . . . and I come for poetry too. I come to find out what the word is, hereabouts. The Fiddlehead, the University of New Brunswick, Fredericton-based publisher Goose Lane Editions, and Ross Leckie put on a poetry conference called Poetry Weekend. This weekend is packed with presenters who read their poems with enthusiasm — and youth. Lots and lots of youth. I first met Travis Lane almost eleven years ago at St. Thomas University when she was being honoured with the Alden Nowlan Award for Excellence in the Literary Arts. She signed Keeping Afloat for me. 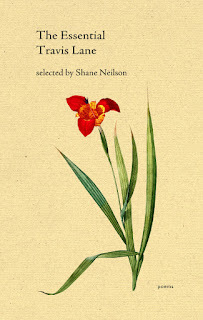 On that occasion I toted copies of Alden Nowlan and Illness, an anthology of Nowlan’s poetry from Frog Hollow Press. When I mentioned this letterpressed anthology to Travis ... she winked. Perhaps this meant she knew a few stories but wouldn’t tell them. I’ve met with her many more times since, including at her home on Windsor Street. I’ve had tea and brought other poets to have a teaful audience with the great lady. But, more importantly, I’ve watched her read. During Poetry Weekend, in what is the Church of Poetry with Memorial Hall as its official title, Travis seems deceptively out of place. To an outsider, she seems like a poet’s grandmother. But when the woman takes the podium, she transforms. At such moments the place was built for her, the assembled poets arrived that afternoon or evening to hear her. In that frail body is more command and power than most poets can ever possess. This selection of her work should establish that command. Travis has a lot to offer any poet or reader, including ones like me who shuffle, youthfully revenant-like, into Memorial Hall. But then why, you ask, isn’t she acknowledged to be in the “front rank” of Canadian poets? Briefly, because Travis’ work should be given space to answer: first of all, she lives in New Brunswick, not a fashionable place to live and be popular in poetry. (If he were alive, it would gall Toronto-basher Alden Nowlan to know that Toronto is still the locus for success in poetry.) Second, she’s a woman who wrote better than most of the celebrated men of her time, and so demonstrably so that I make the following claim with confidence: a better “unknown” Canadian male poet of her vintage isn’t to be found. Third, Travis published with respected but small presses during her career. Fiddlehead Poetry Books and its later life as Goose Lane Editions, Cormorant, Guernica — Travis never transitioned to a major press, though she did acquire the Brick label once. Fourth, Travis never taught creative writing or applied for writing grants. She left pobiz for others who wanted to cultivate disciples and obtain money based on the generation of eloquent proposals pertaining to the creation of art. Fifth, she often (but not exclusively, or even predominantly) writes on religious themes — and that fact can even be mentioned in the bumpf on the backs of her books. This isn’t a way to endear oneself to modern readers. Which brings up, sixth, the aesthetics of the covers themselves: until Travis entered her Guernica period, her books were ugly. If Lane’s reputation was to change, then the public would have to have been tempted first by the look of a book on a shelf. When poets come to visit me in Guelph, Lane’s books form part of a parlour game in which, before an evening winds down completely, I demonstrate how the greatest living poet in Canada has the worst covers possible — I call it the “Inversely Proportional Cover Game.” This is a very Canadian game, I figure. What worth flash? Finally, and I weight this factor the most, Travis is best in the long poem mode — and long poems like to get past surface. Long poems take time. I wish I had triple the space to include a longer work, for her long poems demonstrate her strange brilliance. 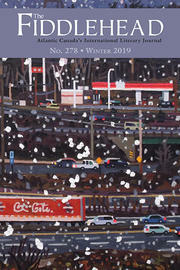 Editor Jeannette Lynes in The Crisp Day Closing on My Hand, a volume of Lane poems selected from 2007, astutely assesses Lane’s work as being open “to idiosyncrasy.” Lynes maintains that Travis lets “the odd, the quirky, the eccentric, sing” — and nowhere is this more true than in the long poems, especially in her remarkable “The Witch of the Inner Wood” from Reckonings. she wrote long in the seventies and, readers, the long poems are good. I ask: why haven’t you heard of them? Their worth is impossible to excerpt. 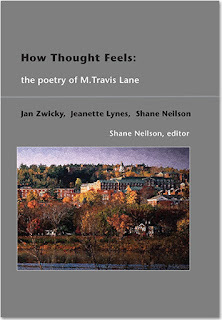 Travis hasn’t been completely ignored of late — as mentioned earlier, Jeannette Lynes oversaw The Crisp Day Closing on My Hand: Selected Poems in 2007, a small selected with Wilfrid Laurier University Press. But that book made little difference (garnering a handful of reviews, none substantial, a majority less than a paragraph long) because the crisp day closed on Travis’s potential fame long ago. I have no real explanation as to why, for Travis Lane is the one of the best Canadian poets alive. Perhaps the best answer is the lack of answer. Travis Lane is not a local pet project, a dear old one who got valedictory treatment from The Fiddlehead out of nostalgic, local special pleading. Her work will withstand the scrutiny of international audiences accustomed to reading The Fiddlehead features on famous American poets. At the moment I can’t demonstrate in critical terms what exactly I mean, but it has something to do with freedom, pain, variety, and the poetic word. Perhaps a different venue will welcome that future explanation. 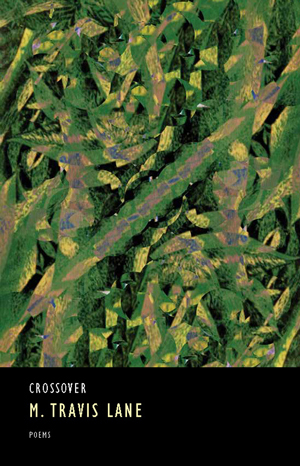 The Fiddlehead pages are a scarce resource and are best given over to Travis’ work. I’ve selected what strikes me, what’s short, and was partial to what’s early. Why the latter? One justification is that the early work is the material those passingly familiar with Travis’ poetry probably haven’t seen. In the main, Lynes preferred to re-republish poems from Lane’s earlier collections by working from the editorial selections made in Solid Things, her mid-career Selected with Cormorant. Though it makes sense to look outside the vision of previous editors, I carefully wrote “justification” and not “reason” because I didn’t select the poems out of a desperate need to avoid duplication. Travis’ early talent is better reflected in the choices I’ve made — in fact, the cruellest cuts came when considering her first full collection. This is the long way of saying that an editor in my position must revel in the inadequacy of a restricted presentation of this poet — she’s so good, she spills over tight borders and her poetry permits disagreements between editors. 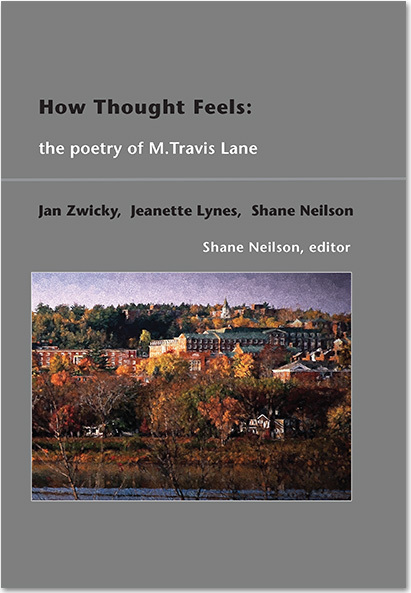 Travis Lane recommends the talents of her editors who have always had it too easy. And Early Lane is particularly astonishing. Canada — no country for old men, women, or talent? Everyone gets things wrong sometimes, but The Fiddlehead hasn’t on this fine occasion. M. Travis Lane's selected prose will appear next year from Palimpsest, and Goose Lane will follow with an edition of her collected long poems.